I review whiskey infrequently because I drink whiskey infrequently, and I think every whiskey review I've posted at the blog has primarily been made up of those qualifiers. The only thing I really know anything about is beer. Beer is the only beverage I really even crave. I know less about wine than I do whiskey, but I find whiskey to be far more intimidating and infinitely more nuanced than anything else I enjoy. All I can do here is post my opinion, which is all anyone does with a review. I know that. I also know that inexperienced reviews are sometimes the most useful to fellow newbies. So, there are all my qualifiers. Make of this review what you will. 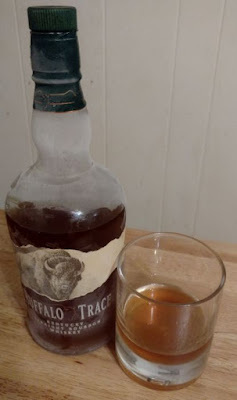 I don't like Buffalo Trace as much as Maker's Mark, which will probably always be my go-to bourbon. I'm inherently conservative, especially with regard to liquor, both because of it's potency and it's price. Maker's Mark hits the spot for me, and it's a spot I feel the need to hit only occasionally. Having said that, Buffalo Trace does taste good, and at least in my area it's significantly less expensive than Maker's Mark. So those are definitely factors. This tastes far better than the stuff I think of as frat house whiskey, Jim Beam and Jack Daniels and the like. Buffalo Trace pours a bright amber color, and the aroma is slightly sweet malt and oak notes, as I'd expected. The flavor up front is sweet, with vanilla notes and mild spice that linger through the finish. The finish is where this stuff doesn't quite live up to Maker's Mark. In fact, the close is far closer to the mid-shelf Beam/Daniels alternatives. It's a little minty, like mouthwash, at the end. Not quite medicinal, but neither as smooth, nor as complex as Maker's. What can I say, that's my standard for bourbon. Until it's exceeded, that's the standard other bourbons will have to meet. I'm glad I tried Buffalo Trace, and the bottle won't sit around neglected in my freezer. But next time I crave that rare bottle of bourbon, I'll probably go back to my old standby. Another six, with some more autumn beer. Last week I tried a pumpkin stout, and I really enjoyed it, which I don't say often about pumpkin beers. Flying Dog's The Fear Imperial Pumpkin Ale is what I think of as a traditional pumpkin beer ... by which I mean I don’t like it very much. This beer pours dark brown with orange highlights along the bottom and sides of the glass. The head is average, and the aroma is rich and sweet. There’s some brown sugar, ginger, cloves, the usual pumpkin beer notes. The flavor isn’t bad up front, with all of that spice being the dominant character, but the finish is awful. The alcohol is noticeable and medicinal, like cough syrup or NyQuil, and the closing quality is fishy. Literally fishy, like water that’s had frozen fish thawing in it. I will not have this again. Paulaner Original Münchner Märzen is what we know in America as an Oktoberfest beer. It pours a clear, pale orange with little head. The aroma is extremely mild, but I can pick up on a little brown sugar and cereal malt. the flavor is the same. No real hop notes at all, just mild, sweet malt. Not my kind of thing. I don’t know, maybe it’s just me. These authentic German Oktoberfests generally taste the same to me. Like the previous one, Hacker-Pschorr Oktoberfest Märzen pours a fairly dull orange with average carbonation and quick-fading head. The aroma is mild, slightly sweet, slightly syrupy, maybe a little more hop character than other Oktoberfests. The flavor is more of the same but even more muted than other beers in the style. Meh. And also, too, there is Weihenstephaner Festbier, which too is an Oktoberfest beer from Germany, also. Weihenstephaner Festbier is pale yellow, average head, faint fruity and yeasty esters, a tiny bit of hop tingle on the finish. Also, it annoys me that these German beers are bottled in the metric system and translate to 11.2 ounces instead of the 12 ounces I am used to as a by-God ’Merican. If I’m gonna drink a beer I don’t really enjoy, I want there to be a lot of it. I feel mislead by the name of Firestone Walker Oaktoberfest, especially with regard to the way the word OAK is prominently displayed on the can. Oak aging? Nope, as it turns out. Which might not have worked for the style anyway. Rather than an indication of oak aging, this beer is named OAKtoberfest for the name of the town where the brewery originated. Look, oak aged beers are an important subset of craft brewing, and many of us are drawn to them magnetically because of the rich, boozy character that oak aging provides. Firestone Walker should know better than this kind of deceptive branding. So, this beer pours clear yellow/orange with a lot of crackly head. The aroma is mild, lemony citrus. The flavor is mild, like most oktoberfests. A slightly sweet, cracker/pretzel malt character finishes with grassy hops. Not awful. Not very good, either, as I find typical of the style. And I'd deduct overall points for the misleading name. I didn't expect much from the new Lagunitas pale ale, which is out in cans in twelve-pack boxes. This beer pours very bright, clear yellow with average head and a lot of carbonation. The smell is sweet citrus, meringue, just a tiny bit of spice. The flavor is juicy, bright, and a little bitter. The finish is rich and smooth. I actually enjoyed this beer quite a lot, and I should not have prejudged it because of the packaging. I will probably buy it again. It's Labor Day, so I guess it's time to start talking about autumn beer. And, already with the pumpkin beers all over the damn shelves. I make myself review one every fall, whether I want to or not, and decided to take the hit early this year. Sometimes it works out in my favor. In fact, I can think of one pumpkin beer that I actually love. 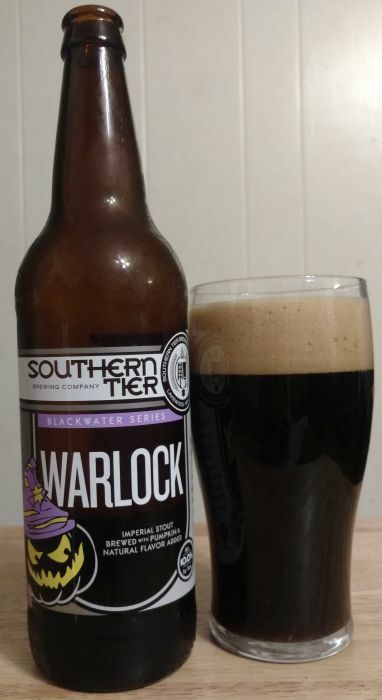 I heard good mumblings about Southern Tier's Warlock Imperial Pumpkin Stout last year and decided to go ahead and try this year's release. What I found was a pumpkin spiced imperial stout with enough strong, rich, bitter malt to stand up to the pumpkin spice. I was pleasantly surprised. Warlock pours black with a creamy head. The aroma is rich and bready, and does have the typical pumpkin/cinnamon/nutmeg qualities of a pumpkin ale. But it works here. I don't say that very often, but I'm saying it here: the pumpkin spice adds to this beer rather than covering up or distracting from a baseline brew. This beer's flavor is like washing down a slice of pumpkin pie with a dark chocolate latte. The finish adds some vanilla and some nuttiness. I cannot deny that I liked this. I'm going to buy it again, on purpose. 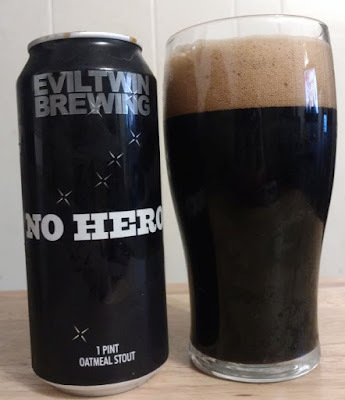 Had another brewery released Evil Twin's No Hero Oatmeal Stout, I’d probably be heaping praise on it. But I find it impossible to drink this very good stout without the context of Evil Twin’s assortment of superior stouts framing my opinion. Compared to Even More Jesus and Imperial Biscotti Break, No Hero is only OK. It pours black with a little bit of tan head. The aroma is coffee and chocolate and roasted oatmeal malt, as expected. But only as expected, a qualifier I rarely use for Evil Twin stouts. The really rich, almost sweet oatmeal malt is so dominant on the finish that it almost castrates the stronger qualities. Somewhat thin mouthfeel, at least when compared to those superior Evil Twin stouts I mentioned before. Don’t get me wrong, this is a damn fine beer. But it’s not at the top of my list of Evil Twin stouts. EMJ and IBB are explosive beers. This one is only a very good beer. Evil Twin has made me change my plans before, out of fear that I would miss out on an opportunity to purchase their releases. This particular beer will not make me change my plans. I don't know if it could have been better named. 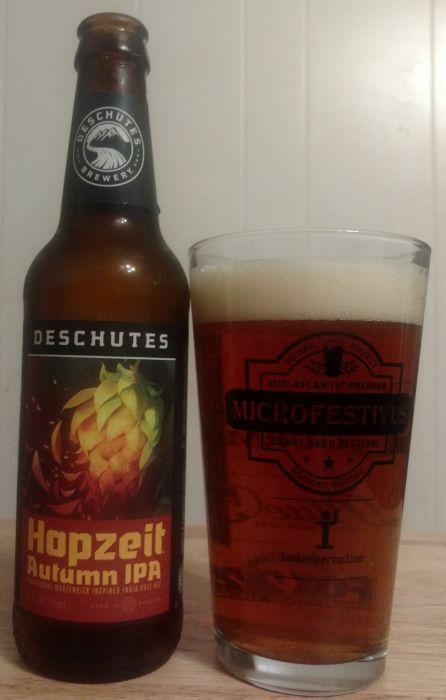 I don’t know what makes Deschutes Hopzeit an "autumn" IPA, but it’s a decent beer. Hopzeit pours dark gold color with a lot of foam. The aroma is mild. Slight pine hops notes, but nothing much for the nose. The flavor is bigger and far better than the aroma suggested. Mild malt with a fairly bitter, bright hop punch in the finish. Went down easy, which is no complaint. 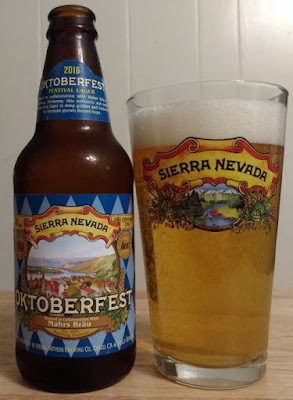 The 2016 version of Sierra Nevada’s collaborative Oktoberfest offering isn’t as smooth or as rich as last year’s version, although it’s still very good. I’m told that what I’m missing here are the sweet and fruity notes that many American breweries bring to the style, and that this version (brewed with Germany’s Mahrs Brau) is more authentically German. Maybe so. It’s definitely still a good beer. It pours hazy yellow with a fair amount of head, and the aroma is lemon, cracker malt, and a background of mild spice. The flavor adds a dry, tight finish. It isn’t bad at all, but I’m not surprised at how much I enjoy it, the way I was last year. So, this is a sweet stout, a style that has inspired nothing but "meh" from me. It's called Quick Start My Heart, which is an awful name. And DuClaw bills it as a Strawberry Milk Stout. I bought this beer mostly out of curiosity, sorta expecting it to be awful, and it is not awful. It isn't very good, but it's not awful. It's OK.
Quick Start My Heart pours medium-dark brown with a creamy, crackly head. 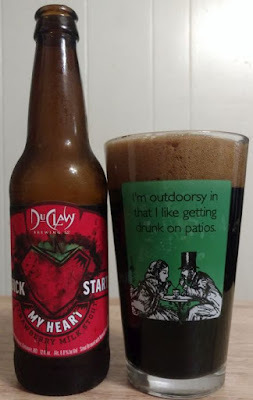 The aroma is an average sweet stout with artificial strawberry notes. Yes, it does remind me of Strawberry Quick. Thankfully, those notes are very muted in the flavor. This is just an average sweet stout with some coffee and mildly roasted malt character, and a hint of sugary strawberry candy. 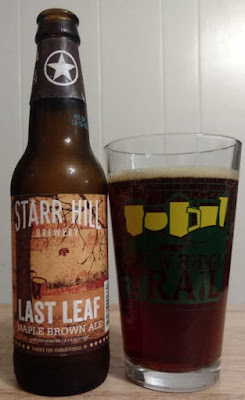 Starr Hill's Last Leaf is a brown ale with maple. It pours a deep copper with a quickly fading head. The aroma is a little bit of buttery malt and some grassy hops, and distinct maple. The flavor is warm up front, with a little spice, but it closes with too much maple for my taste. When maple is done right in a beer, you're not even sure you're tasting it. It's just part of the oeuvre. (See Dogfish Head's 75 Minute IPA, the best maple beer I've had, and the best DFH beer I've ever tasted.) 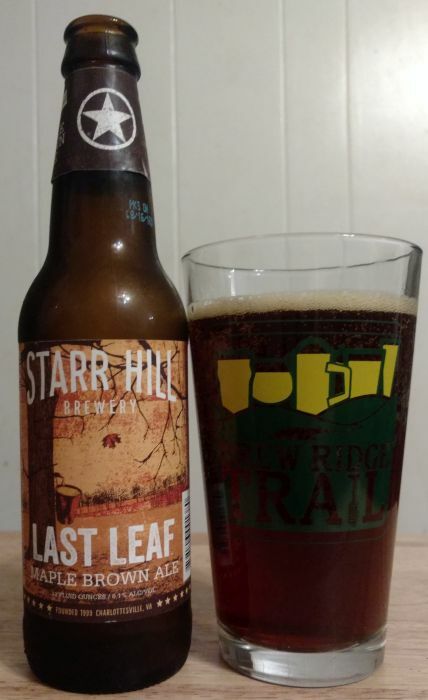 I was tired of the maple in Last Leaf by the time I finished the bottle.